Stop searching - keep working! dry-hire.com is your one stop destination for dry hire deals. Offer your items now or find products for your next event or production. The first international industry solution for rental companies – a powerful and first and foremost time-saving tool for material dispatchers. Benefit from the advantages of being a member of the first international material network for lenders and service providers! With dry-hire.com you can increase your rental stock’s utilisation rate and decrease your outlay for material scheduling. Within seconds, our material search engine helps you to find the items required for your project in the listed partners‘ and colleagues‘ rental stocks. Benefit from your expanded partner network and provide other lenders with your own rental items with just a few clicks. Brand NEW: Your personal company profile is a optimized web contact card, especially developed for Google and mobile devices. Optimized for Google and mobile devices. Your profile is found even faster in search engines. Your offers and contact details are clear, mobile optimized, ssl encrypted and complete on one page. Design your profile with a logo, colors and your own graphics. There are no advertising banners, menu bars or offers from other companies. 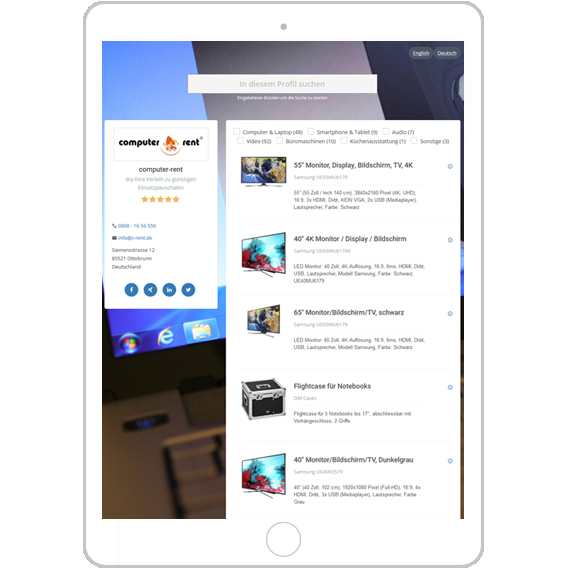 Take advantage of our special search engine programming, specifically optimizing your offers and products. The "one-click"-submit makes your new web business card ready within minutes! search result includes information for establishing direct contact with rental depot in your vicinity. chat feature to communicate with the offering party in writing. rating system to ensure trustworthy cooperation. dry-hire.com won’t cause you any extra work – promise! complete inventories can be imported or exported via CSV Upload within a very short time. Was does the term “dry-hire“ mean? dry-hire is the international standard term to describe rental services of goods among lenders, e.g. in order to avoid a bottleneck in their own material stocks. On dry-hire.com you can offer your own rental stock to other lenders on dry-hire basis and find material required for your own projects via the integrated search engine in the fastest and economically as well ecologically most expedient way. Thereby, this tool attaches greatest importance to time saving! Unconnected with the end user, dry-hire.com is an integrated system which is an effective tool for rental companies and service providers! 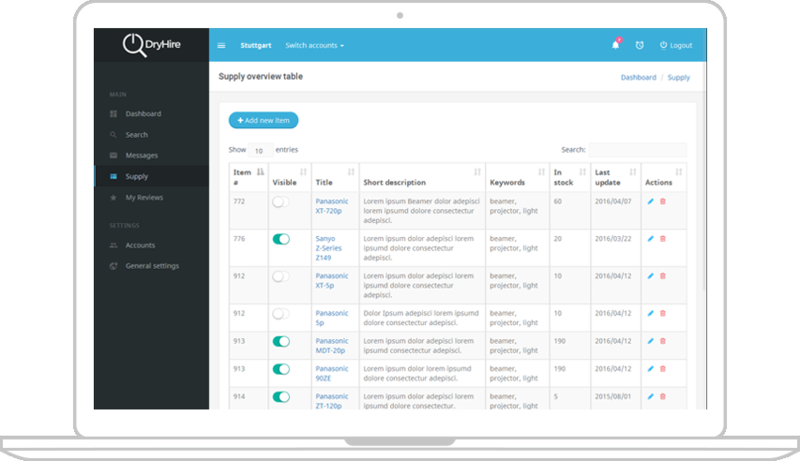 You can swiftly populate individual items or complete inventory lists via our CSV upload system. By means of the simple free text search function, they then become visible together with your contact information. The search results are sorted according to the distance to your search location. In the rental industry, it is common practice to cooperate and to work with the stocks of other lenders. The dynamics of this business area as well as years of experience of professionals in the rental business form the basis of dry-hire.com. This tool is designed to be the global marketplace for all rental companies who lend their own stocks on dry-hire basis. How long is my main account valid? Main and subaccounts are valid for 99 years as of registration. What is an employee account / subaccount? 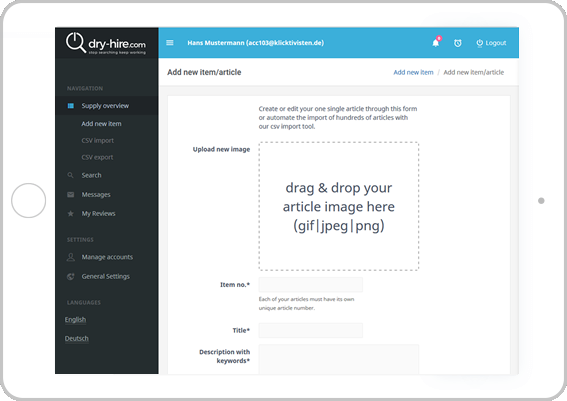 Employee accounts can be set up free of charge as needed so that your employees are provided with free access to dry-hire.com and can use the platform freely. These subaccounts have the same rights as the main account – in this way, a company’s employees can work cooperatively on their own inventory lists and reply to enquiries. Test the free text search function! Here you can see all the information required for contacting the offering party directly as well as the item description. Quick and easy! Are commission fees charged for contact mediation? How is communication effected on dry-hire.com? You can make contact by phone via the contact field next to the article description or you can use the internal chat system. Chat contents are not personalised but always only refer to individual items. In this way, each employee can easily access any communication dealing with written requests via their subaccounts. Does dry-hire.com have a shop-in-shop system? Are contracts concluded via dry-hire.com? No. The conclusion of contracts is effected without dry-hire-com being involved. Is there a rating system for members? Yes. You have the opportunity to rate offering parties and you can be rated yourself. How much does it cost to use dry-hire.com? The costs incurred by using all basis-functions as well as all the employee accounts are free. Do I get an invoice for additional services? Yes, you will be sent a proper invoice specifying German VAT by mail. Can I claim VAT as a non-German company? No. We pay this tax for you in Germany in order to facilitate processing and to ensure legal compliance. The reverse charge procedure cannot be applied. Can I cancel my account prior to the end of the term of contract?